The fifth edition has been fully revised to reflect the latest knowledge, diagnostic methods, and practices in veterinary laboratory medicine. A companion website provides the images in PowerPoint and references linked to PubMed at www.wiley.com/go/latimer. Duncan and Prasse’s Veterinary Laboratory Medicine is an excellent quick reference for practicing veterinarians, veterinary students, clinical interns and residents, and pathology residents. Kenneth S. Latimer, DVM, PhD, Dipl. ACVP, is a veterinary clinical pathologist at Covance Laboratories, Inc. in Vienna, Virginia and Professor Emeritus in the Department of Pathology at the University of Georgia College of Veterinary Medicine in Athens, Georgia. He has over 32 years of experience in the specialty of veterinary clinical pathology in academic, research, private practice, and industrial settings. A new companion website provides all the images from the book in PowerPoint and references linked to PubMed. 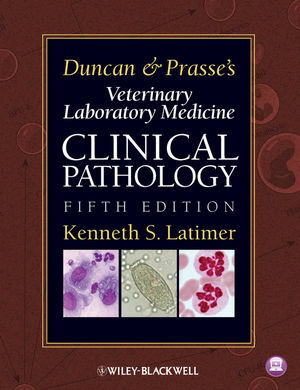 Duncan and Prasse's Veterinary Laboratory Medicine: Clinical Pathology companion website features images from the book in PowerPoint and the references linked to PubMed.